Howrah district is located along the western bank of the Hugli, parallel to Kolkata city. The densely populated Howrah City, once known as the “Sheffield of the orient”, is famous for its thousands of small industries manufacturing engine components. Air: The nearest airport is at Kolkata, which is connected by various national and international airlines with other parts of India and the world. Rail: The Howrah railway station is a very busy station with regular train services to many parts of the country. Road: A good network of roads covers Howrah district. 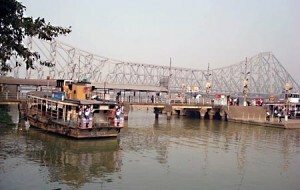 The famous Howrah Bridge links Howrah with Kolkata city. Bagnan: The temple of Madangopoljiu in the Mellak village is of considerable archaeological interest. Built in 1651 A.D. the temple contains specimens of early terracotta art. Belur Math: Swami Vivekananda, the illustrious deciple of Ramakrishna Paramahamsa, the 19th century saint, built the magnificent temple here in 1899. Located on the Hugli River bank, this temple is also the headquarters of the Ramakrishna Mission, which controls a chain of ashrams and social service centers throughout the world. gardens for a nominal fee and drive along the ornamental avenues lined with towering palms and deodars. Syampur: Located near the confluence of the Bhagirathi and the Rupnarayan, Gadiara Village commands a magnificent view of the two mighty rivers. The main attraction here is the ruins of Fort Mornington Point, said to have been built by Lord Clive to guard the entry of ships up these two rivers. This entry was posted in Howrah, West Bengal. Bookmark the permalink.